What has to be said about Statliru1.ru? Statliru1.ru is classified as a browser hijacker that will definitely make your web browsing experience worse. If the hijacker has found your electronic device, you will be redirected to http://statliru1.ru/i/rt2.html. Statliru1.ru will modify your internet browsers’ settings without your permission. 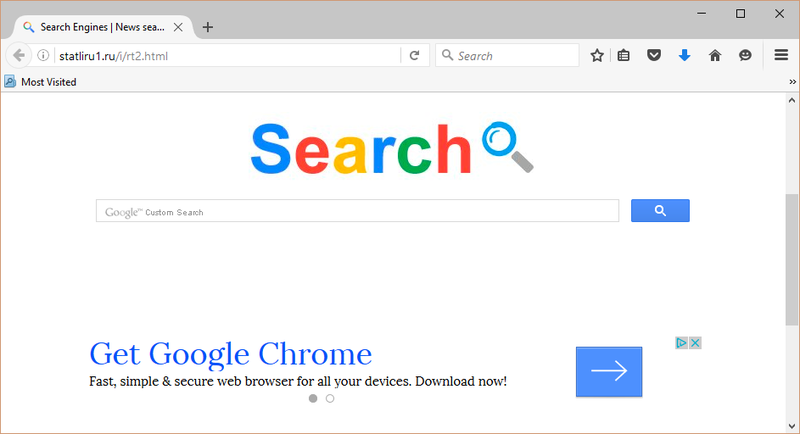 Very soon your Google Chrome, Mozilla Firefox, and Microsoft Internet Explorer will have a new tab, a different search engine, and homepage. As soon as these modifications take place, your virtual machine will become more vulnerable to the other threats. This happens because among the actual search results, Statliru1.ru developers infiltrate various ads that usually lead to unreputable internet pages. Therefore, you should carefully choose which web sites to visit. More than that, we recommend that you delete Statliru1.ru immediately. The unwanted application will do more harm than good. Why Statliru1.ru removal is necessary? If you do not delete Statliru1.ru soon, the application will start performing many unwanted changes. Your electronic device will be filled with all kinds of ads. This can slow down your computer’s system. In addition to that, you will exposed to the websites that may bring even more annoying applications to your PC. Your personal information will be at risk as well. Statliru1.ru gathers data about your web surfing activities. The information usually includes your search queries, commonly visited web sites, and other things that can help the cyber criminals determine which type of ads you prefer. After they find out the commercial material you may like, your computer will be bombarded with that type of ads. Therefore, you should protect your own private data and also your computer’s system. In order to do so, you will have to remove Statliru1.ru as soon as possible. Our research team has prepared a detailed elimination plan that you can find bellow. Make sure that you carefully follow the instructions or the hijacker may find a way back to the PC. How to take care of Statliru1.ru removal? It may be tricky to delete Statliru1.ru from your computer’s system. Especially because Statliru1.ru will apply registry entries to automatically open your web browsers. Therefore, you will not only need to delete Statliru1.ru, but also all the other programs that might come with it. If you do not uninstall Statliru1.ru completely with all of the unwanted programs that might have come with the hijacker, your computer will still be at risk. Therefore, you should take the Statliru1.ru removal process seriously. In order to achieve the best results we suggest using the professional help. You can delete Statliru1.ru automatically by installing a reliable malware removal tool. Your antivirus program will detect and erase all the questionable applications automatically. In addition, you will no longer have to worry about the questionable applications entering your computer. If you keep your antivirus program up to date, the security tool will protect your PC from all the future threats. Thus, you should not waste any of your time and remove Statliru1.ru once and for all.